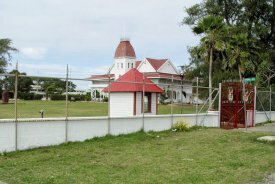 The picture shows the Royal Palace on the waterfront area at the Tongan capital of Nuku'alofa. Tonga, which is a kingdom in the South Pacific Ocean, is one of the first places in the world to celebrate the arrival of the New Year. This was one of our ports of call when I was sailing on the ' ss Oriana ' which operated cruises from the Australian city of Sydney from about 1979 until 1986.